Fall just wouldn’t be the same without apples. That’s a fact. 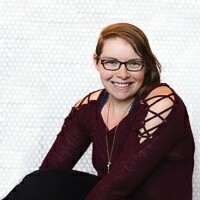 Unfortunately, though, it seems like apples miss out on their time in the spotlight because we’ve come to expect them. Apples are always on grocery store shelves, they’re usually cheap, and we all grew up eating them. These wonderful fruits have lost their novelty, so we no longer celebrate their season. Which is a shame, because apples were cool way before PSLs existed. And I’m not saying apples are better than squash or pumpkin, per say, because I absolutely love squashes, too. Pumpkin muffins are my jam. 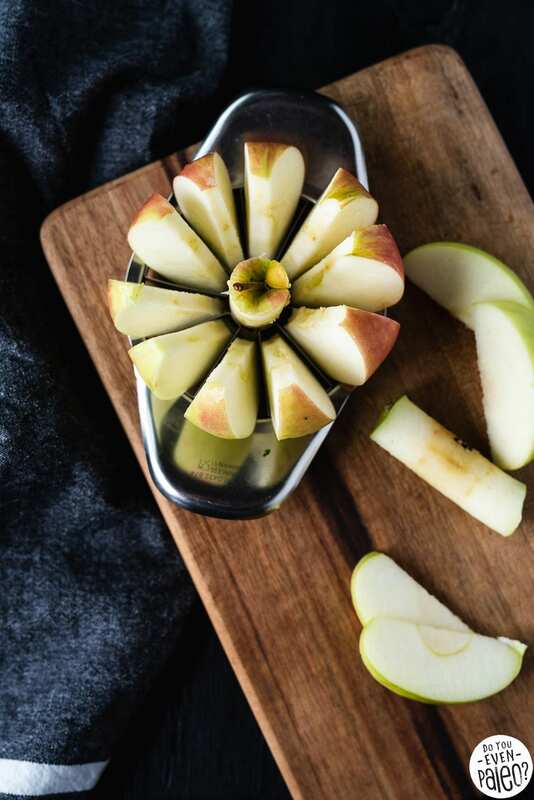 But all throughout autumn and winter, my favorite snack is sliced apples with nut butter. My favorite easy winter salad addition is crisp chopped apples. My favorite dessert is Apple Walnut Bundt Cake. That also happens to be the only dessert my husband specifically requests. 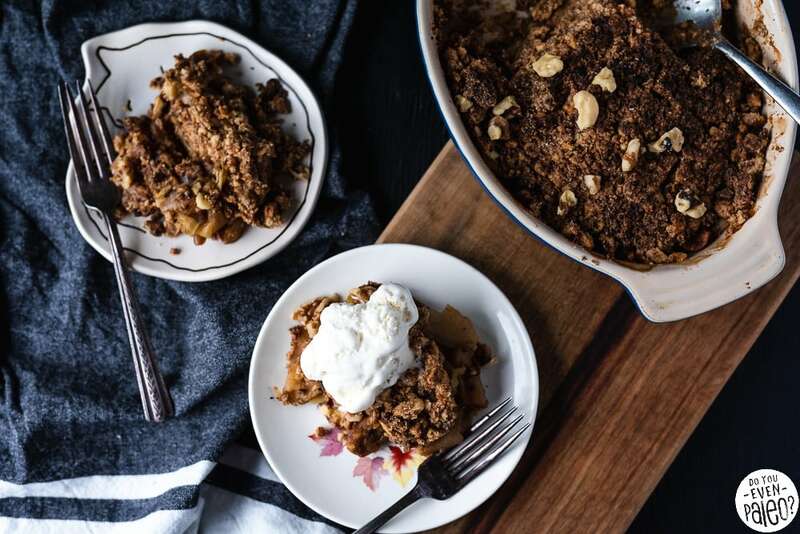 So it only seems right to welcome Fall 2018 with a new apple-based dessert. 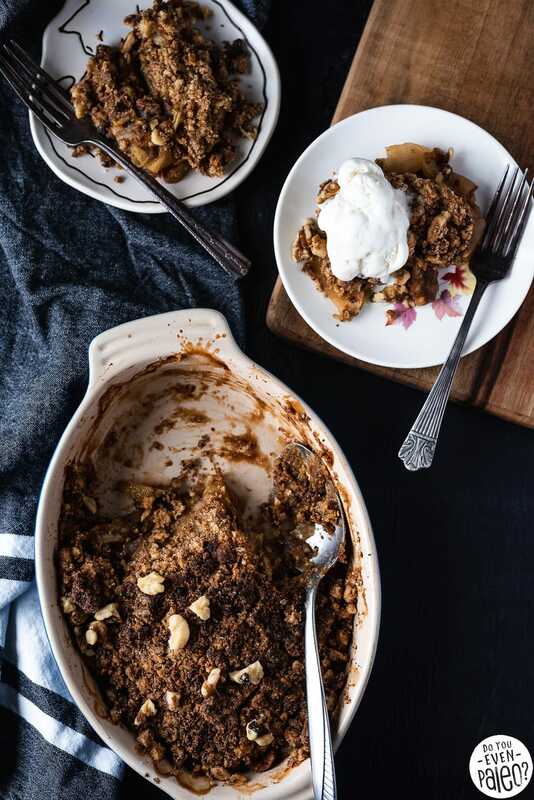 And hey, since the apple walnut pairing goes so well, why not combine the two again for a gluten free apple crisp? Trust me, it’s a good idea. 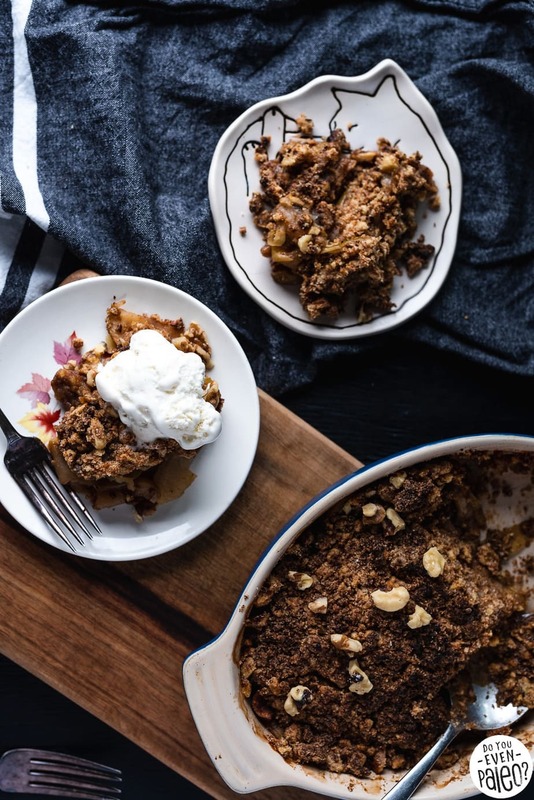 You’ve got to love apple crisp. 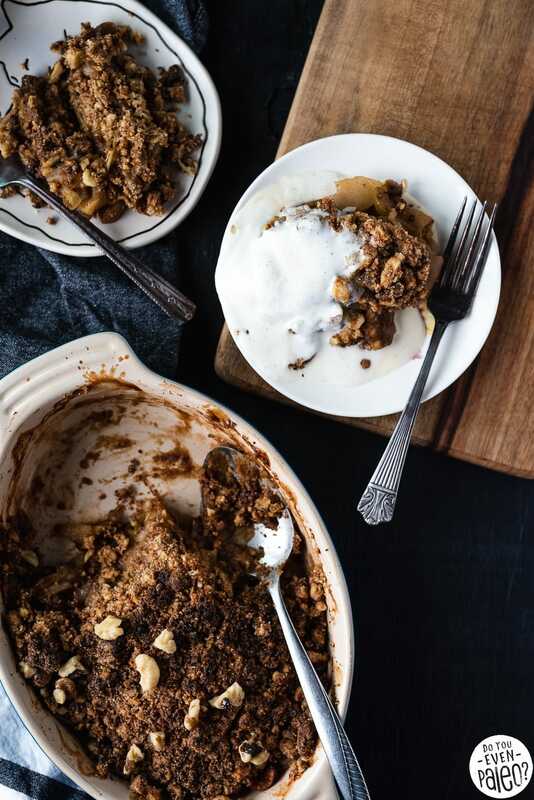 In a way, fruit crisps and cobblers are like the lazy baker’s pie. 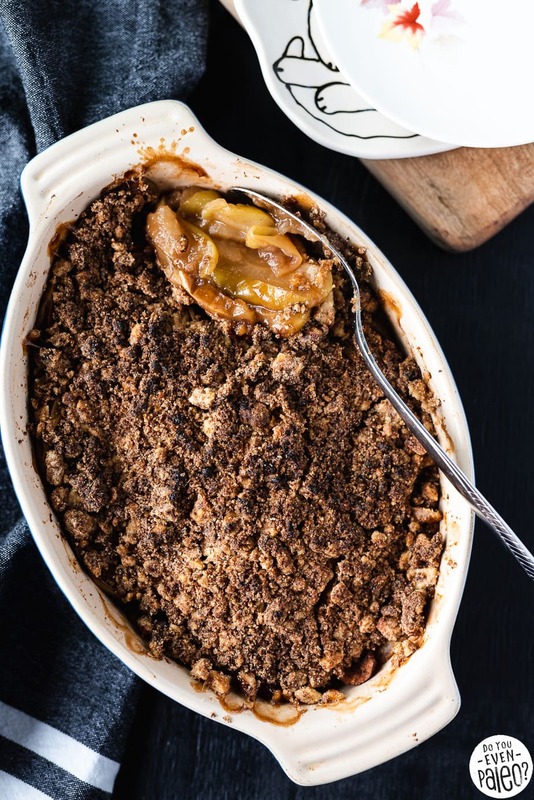 The filling is essentially the same, but instead of fussing with a crust you just make a crumble that coats the top. You never miss the crust! 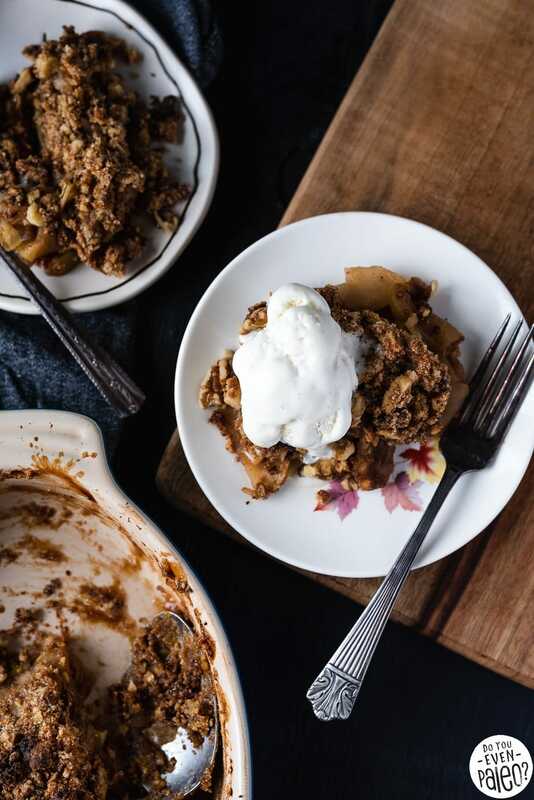 Of course, apple crisp is best enjoyed with a scoop of ice cream. Not required, but always recommended. 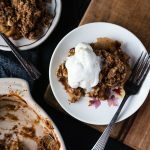 If you’re looking for a dairy free ice cream recipe to serve with this gluten free apple crisp, visit this post for a basic recipe! 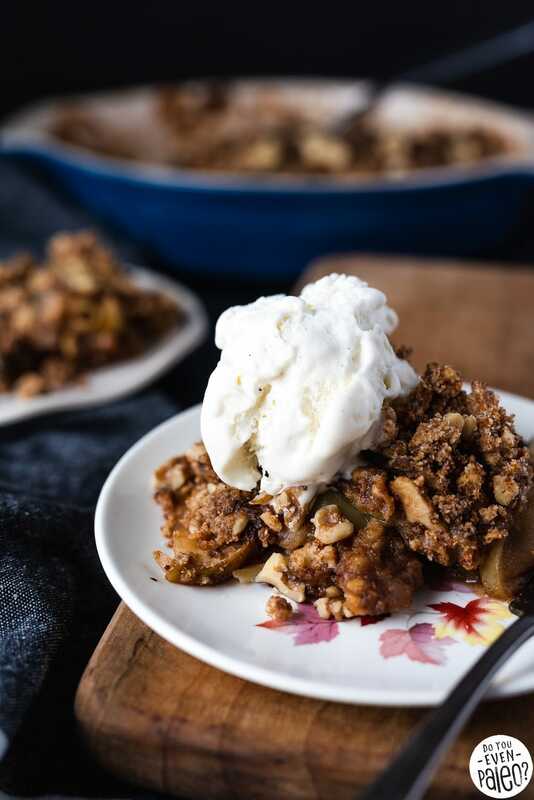 Or you could go a little crazy and serve the apple crisp with a scoop of diary free Pumpkin Hazelnut Ice Cream. 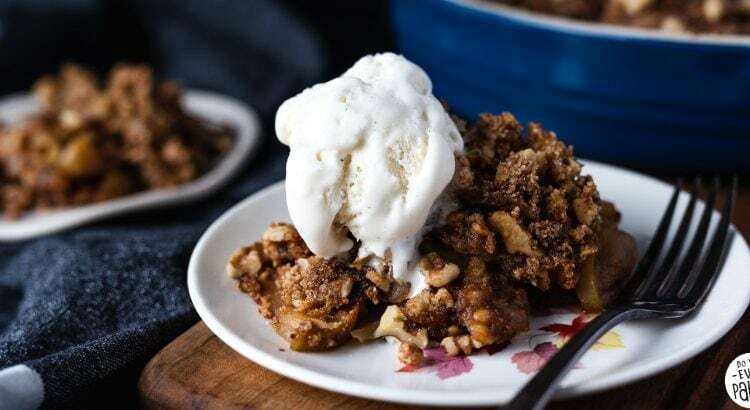 Gluten free apple crisp is even better when you add in toasted walnuts! 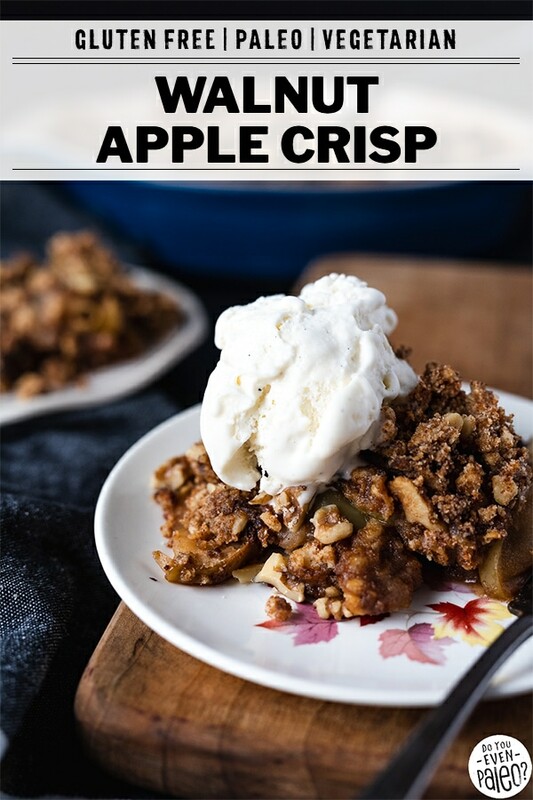 I use gala, granny smith, or honeycrisp apples for this recipe. Serve it with some ice cream for the ultimate autumn treat! Preheat oven to 375°. Spread walnuts out on a parchment paper-lined baking sheet. Transfer to the oven and toast the walnuts for about 7 minutes, until fragrant. Remove from the oven and let cool. 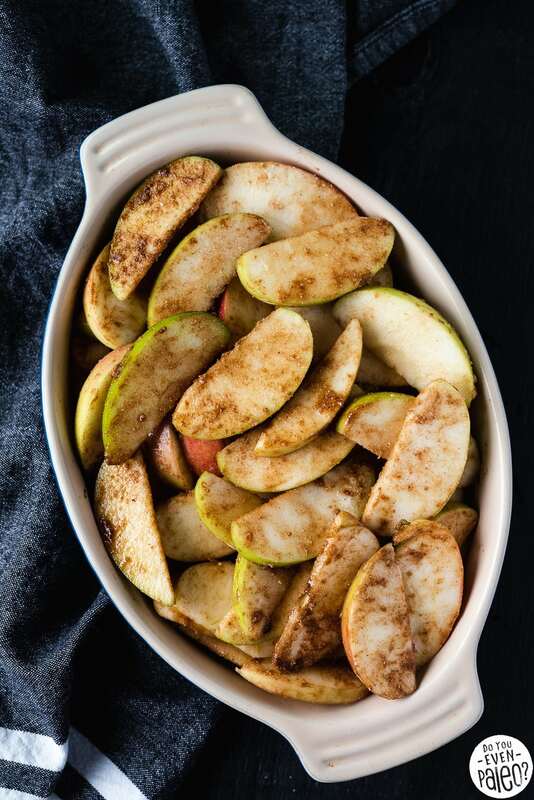 In a large bowl, stir together apples, 1/4 cup coconut sugar, 1 tablespoon cassava flour, lemon juice, and cinnamon. Spread out on the bottom of an 8-inch square baking dish. In the same large bowl, combine remaining cassava flour, walnuts and remaining coconut sugar. Cut in chilled ghee. 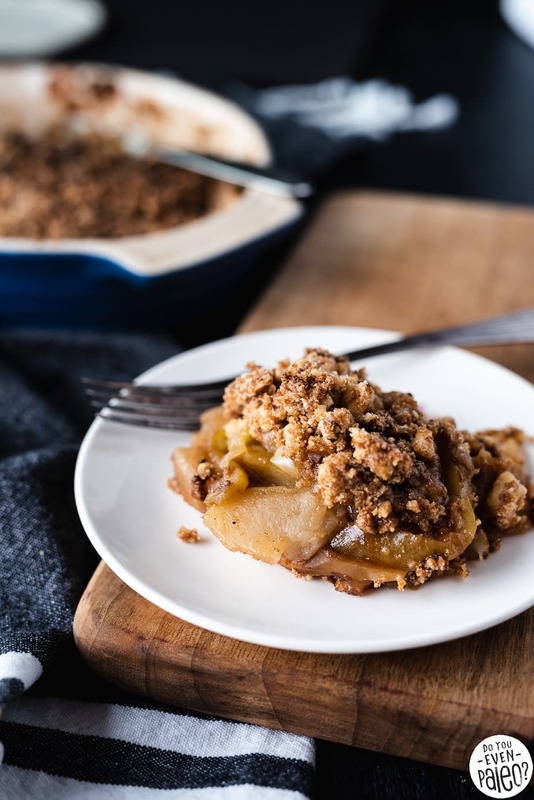 Sprinkle crumble overtop the apple mixture. Bake for 35-40 minutes or until the topping is golden brown. Serve warm with ice cream. Don't subscribe All Replies to my comments Notify me of followup comments via e-mail. 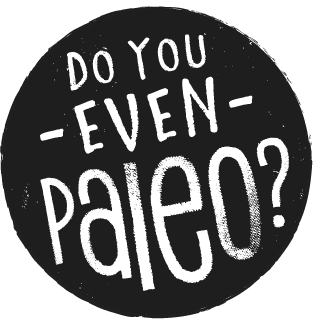 You can also <a href='https://www.doyouevenpaleo.net/comment-subscriptions/?srp=5406&srk=87505361eee98908ddf6ccb8681f50d6&sra=s&srsrc=f'>subscribe</a> without commenting.